Over the summer I have been working in Dr. Bryan Mackenzie’s lab at the University of Cincinnati College of Medicine in the Pharmacology and Systems Physiology department. My focus has been on finding novel therapeutic targets in the treatment and/or prevention of iron overload disorders. Hemochromatosis is just one of several common hereditary disorders that result in iron overload and subsequent liver disease, heart damage, and a slew of other health disorders across several body systems. Since there is no regulated mechanism for iron excretion, iron homeostasis of the body is regulated by iron absorption. 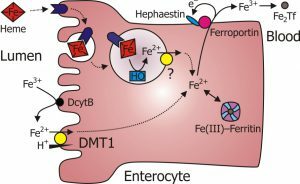 The main mechanism by which non-heme iron (the majority of iron humans consume from their diets) is absorbed from the small intestine is the divalent metal ion transporter-1 (DMT1) (3). 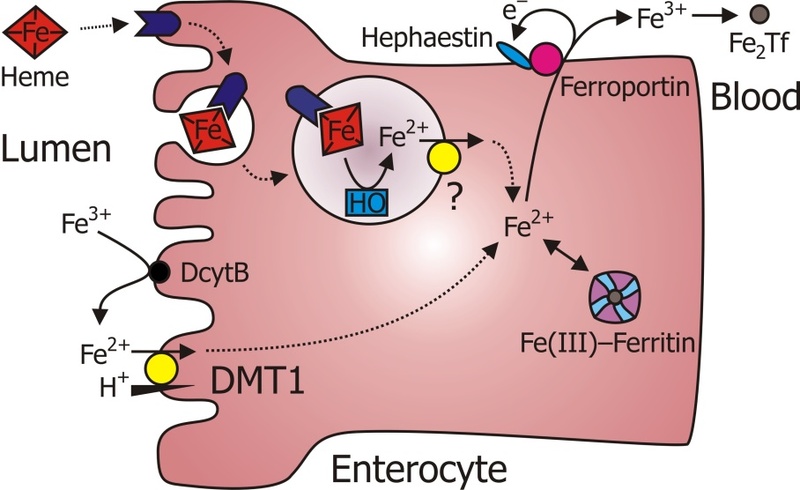 DMT1 is already a validated therapeutic target in hereditary hemochromatosis. More recently, the Mackenzie lab identified a role for the Na+/H+ exchanger-3 (NHE3) in intestinal absorption of non-heme iron by DMT1. The Mackenzie lab demonstrated that NHE3 generates the driving force for iron absorption via DMT1 by transporting protons into the small intestine (2). My project this summer has built upon this prior knowledge using an Hfe knockout mouse model. Rendering this single gene inoperative in mice results in a very good model of iron overload. We are then able to test the hypothesis that iron overload in the Hfe KO mouse can be corrected by ablation of NHE3. The idea is that without NHE3, the driving force for DMT1-mediated iron uptake is reduced, thereby reducing iron absorption. If the data supports this hypothesis, we can conclude that ablating NHE3 prevents iron loading in the Hfe mouse model of hereditary hemochromatosis. Even further, we can reveal intestinal NHE3 as a potential therapeutic target in the treatment of iron overload. Throughout the summer I have learned countless basic research techniques and have mastered various skills that are good to possess in the Mackenzie Lab. I have learned how to ween and care for our colonies of mice. I now know how to genotype them using tail clippings and polymerase chain reaction (PCR). This step is especially important because it determines which mice are our experimentals, or the mice we collect blood and tissue samples from on experiment days. 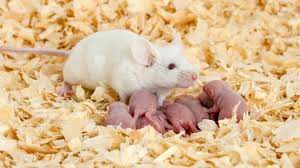 I was placed in charge of the mouse experiments, learning how to effectively set-up and delegate responsibilities. Being my first full-time experience in a research lab, I appreciated this opportunity to take charge and have ownership over such a large task. I also had the task of running serum iron assays and non-heme iron assays on freezers full of samples that have been collected. This task proved to be challenging and slightly stressful at times, as I found errors in our established assay protocols and analytical procedures. For example, some mice had very little blood collected on experiment days, meaning I had very little serum to run the assays. When the protocols had detrimental errors, I felt I had wasted irreplaceable serum at times. Luckily, I have corrected our protocols and have finally organized/assayed most of our samples. I have also not only learned how to operate a software program called SigmaPlota to analyze my data, but have learned how to edit our labs established transformations within this software. This summer full of learning techniques, troubleshooting, and analyzing my data has been an invaluable experience. I have transformed into a proficient, independent, and productive lab member in just a few months’ time. I have enjoyed my day-to-day life in the lab this summer. I was pleased to learn that a 9-to-5 workday is certainly possible, with proper planning. I also understood that some late nights/early mornings are unavoidable, especially when things didn’t go as planned and required a little extra time. I discovered that the environment in the lab was much more relaxed than I anticipated. I was able to control my day to day activities with little intervention, unless I needed assistance or extra guidance. This assistance from other lab members is something I really appreciated. Although everyone has their own projects and own experiments to run, a helping hand was always there when I needed it. I liked this collaborative, team-based environment and believe it greatly increased all I was able to learn in the lab this summer. The only con in the life of a scientist that I can think of is the down time that sometimes occurs, as I’m the type of person that likes to stay busy. Luckily, I was able to fill my time by reviewing relevant literature in the field or discussing my progress with other lab members. Overall, I really enjoyed getting to experience the life of a scientist for a summer and look forward to finishing up my project/exploring new directions in the lab. Mackenzie B, Garrick MD. Iron Imports. II. Iron uptake at the apical membrane in the intestine. American Journal of Physiology-Gastrointestinal and Liver Physiology289, 2005. Shawki A, Anthony SR, Nose Y, Engevik MA, Niespodzany EJ, Barrientos T, Öhrvik H, Worrell RT, Thiele DJ, Mackenzie B. Intestinal DMT1 is critical for iron absorption in the mouse but is not required for the absorption of copper or manganese. American Journal of Physiology-Gastrointestinal and Liver Physiology309, 2015. Shawki A, Engevik MA, Kim RS, Knight PB, Baik RA, Anthony SR, Worrell RT, Shull GE, Mackenzie B. Intestinal brush-border Na /H exchanger-3 drives H -coupled iron absorption in the mouse. American Journal of Physiology-Gastrointestinal and Liver Physiology311, 2016. 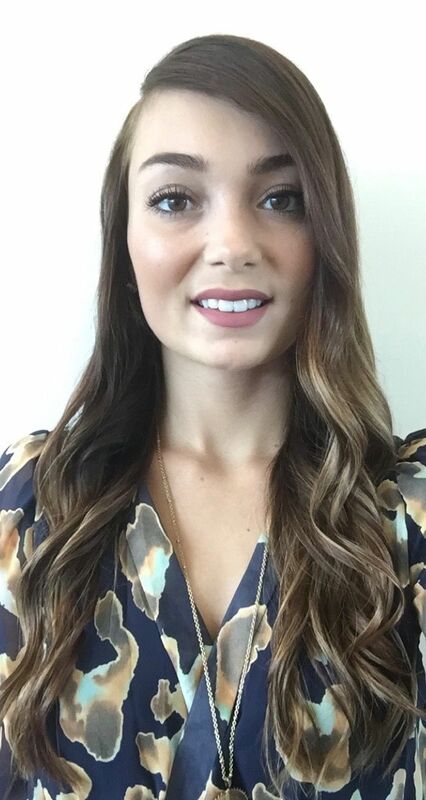 Sydney Stone is a junior majoring in Medical Sciences at the University of Cincinnati in Cincinnati, OH. She is a 2018 Short-Term Research Education Program to Increase Diversity in Health-Related Research Fellow (STRIDE) working in Dr. Bryan Mackenzie’s lab at the University of Cincinnati College of Medicine. Her summer of research was supported by APS and a grant from the National Heart, Lung, and Blood Institute (Grant #1 R25 HL115473-01). Upon graduation, Sydney plans to pursue an MD/PhD or MD/MS in order to become a physician scientist. 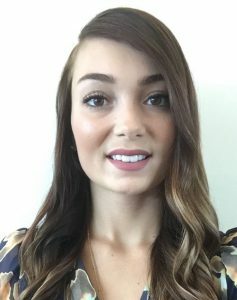 She hopes to combine proficiency in physiology with invaluable access to patients in order to follow her passion for preventing and curing human disease.